While you seeing this post I am still in New York having a great time with Bogdan for my birthday, but I'm also working on a new project. I will tell you more about the project next week. 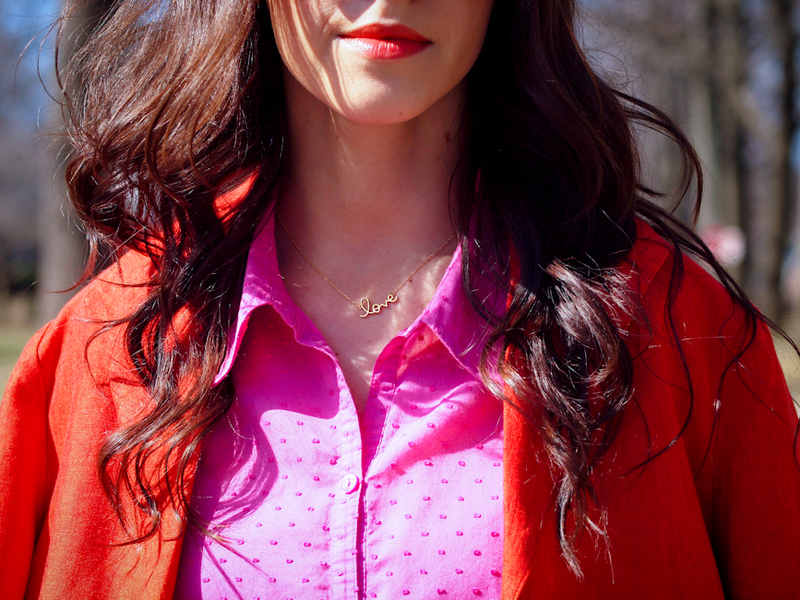 Meantime this is how I manifest my enthusiasm for Spring and warm weather: Colors, Colors, Colors!!! "Color me PINK" said my inner voice one morning... so pink & tangerine it was! Voila! Wow, the combination looks absolutely fabulous. Great color blocking. The pop of yellow is fab! beautiful colors, I love this outfit! 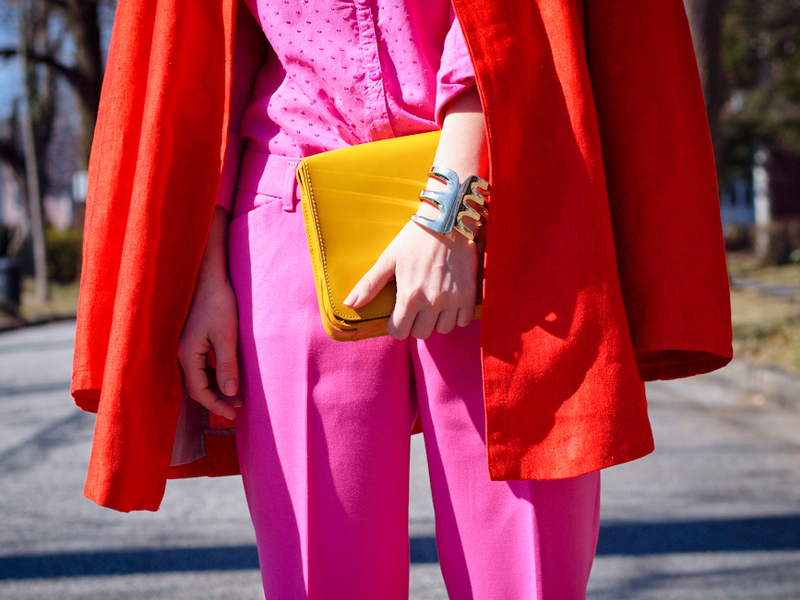 Love this bright color mix! Looks so fresh! Great! Such a fun outfit, love the colors. How great combination of colors!!! I am in LOVE!!! the pink on pink looks unexpectedly beautiful. you pulled it off fabulously! ok now i have to try tangerine and pink….LOVE this!!! This is so gorgeous! Love this entire look. Your colour combinations always blow me away Veronica. 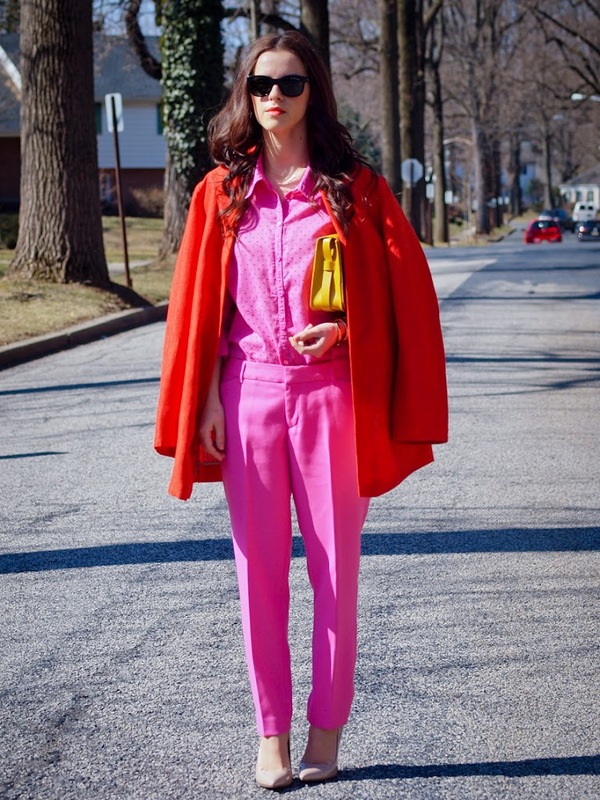 Super bold and daring but never out of place! Loving the pop of yellow to prevent the red & pink from looking too Valentiney. Hope you’re having an amazing time in NYC (SO jealous) and happy birthday!!! You are the woman to wear those colours!! WOW! Amazing outfit, and awesome style! Fun color combo! Obsessed with your trousers!! hello dear. you did great with colors again. its always a pleasure looking your combinations..
by the way One of my blogger friends wrote about you. she wrote it in turkish. let me summarise. she says” if you are bored to see same outfits everywhere take a look bittersweetcolours , she plays with colors perfectly.. I love the mix !